Ideally located, by the sea, near of various interess locals such as the Marina da Calheta, the Centro de Artes Casa das Mudas, nomeated in 2005 to MIES VANDER ROHE prize of architecture. Madalena do Mar has a nice promenade along the beach. This is a house where you from the first sight have "home-feelings" ! is hearthwarming. Before and during the whole trip we received advices and information about what could be interesting to visit and where to go. The house is a pearl in a tropical garden, in a very quiet but centrallayed village, from where it is very easy to start daytrips to all the beautiful nature- and historical corners of the island. outside, reading in the lot of books with historical and art information. On the whole island they have been very hard working to make the traffic easy,and an amazing systems of chunnels brings you even to the highest mountaintop or your startplace of wandering. lot of wanderpaths who brings you to highlights of the nature of the island. We were very happy that you enjoyed, our goal is that anyone who visits us feel at home, enjoying everything the House has to offer. Your opinion is very important so we can always improve and meet the expectations of those who visit us. A gem not to be missed! If you like getting away from the tourist centres, being in a house that's got oodles of character and charm, offers comfort, space, great location, and a delightful garden, go and stay in this property, you won't be disappointed. Huge thanks to our lovely hosts who were both very helpful and welcoming, while being very discrete. We really appreciated all the lovely extra touches: fresh cut flowers from the garden, food provisions to get us going, Madeira wine waiting on the side board, fresh exotic fruit ready to pick in the garden, and eggs directly from the hens out at the back. The location, half way along the southern coast, is ideal for exploring all over the island and sunnier than many other parts. Huge thanks to Maria and Miguel. Our goal is that people feel good and enjoy the House as much as we like. We hope to be able to receive you again in Madalena do Mar. Once again we had a fantastic holiday in this fabulous house. The owners are friendly and helpful and they had even put up a Christmas tree for our holiday over Christmas and New Year's Eve. The house has been lovingly restored and is very well decorated. The rooms are all spacious and well equipped. 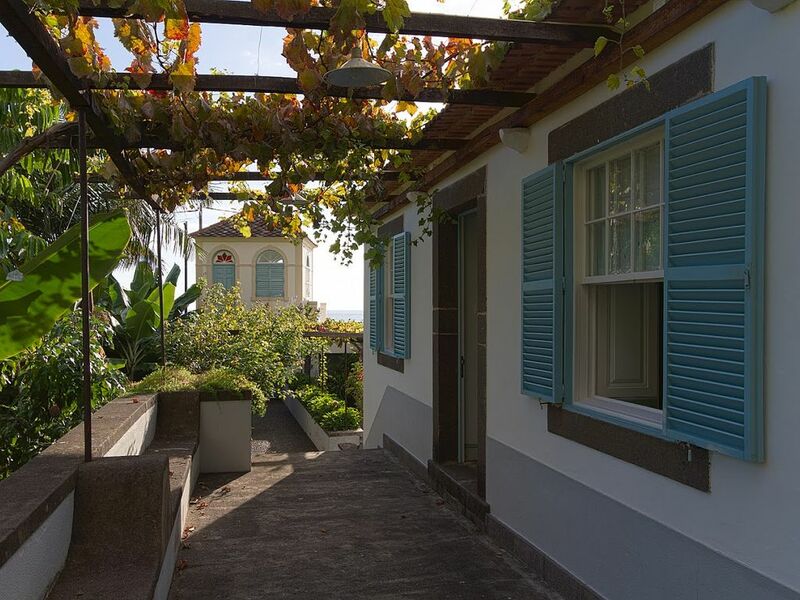 I would recommend this property to anyone visiting Madeira. It is especially well suited to young families, with its fully enclosed courtyard and garden. "A wonderful property, very spacious and well appointed. Everything was exactly as described and we were very happy with our holiday in Madalena Do Mar. We hope to return soon." "Everything was like the describtion." "The was absolutely nothing that we would not like about the property and its location. Everything we had we also wanted and appreciated. This beautiful property, set only meters from the ocean amid banana groves in Madalena do Mar could hardly be more welcoming. In particular it will appeal to the poetic, romantic, nature and/or sports and yoga minded holiday maker, whether families or good friends. It definitely conveys the dignified spirit of authentic Madeiran home and life (do have a look at the great book on Madeiran architecture in the huge cosy living room), without being falsely nostalgic or kitchy. The house is very spatious and comfortable, well equipped with everything one might reasonably need on a self-catering holiday, and certainly well-kept and very clean. The views are not "spectacular" or "stunning", as the house is almost at the sea level. But we never got tired of admiring the quaint privacy of the gardens, the beauty of the house itself, the rock faces behind the house (complete with small waterfalls... very zen! ), the banana groves, and of listening to the ocean. The ocean is best and very romantically admired from the mirador over the front gate, where we had most breakfasts. PARAGLIDERS, attention - you can land on the beach right in front of the house! The house indeed offers first-class paragliding holidays. The non-flying entourage won''t be bored either. To be honest, some people might find it unpleasant that there is a road between the house and the beach. We did not find it a problem. The property is well protected. We never got woken up by traffic. It is however advisable to have someone give the driver the indications about the situation on the road while getting the car out of the garage. MADALENA DO MAR is a nice, real, extended seafront settlement, among the sunniest on the island. We enjoyed the immediate presence of the ocean and the local scene very much. Very close to the house is the "Taberna" (nice and fun both during the day and vibrant nights) and the more refined of the two fish restaurants. We, however, preferred its rougher genuine counterpart up the road, well within walking distance. Madalena is not too far from Funchal, and is a great point of departure for trips around most of the island. In fact, after having seen most of the island, we concluded we wouldn''t want to stay anywhere else." (Text automatically translated) Arts Centre Casa das Mudas (Nomee in 2005 at a price of Architecture MIES VAN DER ROHE) Jonh Casa Museu dos Passos, Marina da Calheta, Floresta Laurisilva (World Heritage Site by UNESCO in 1999, 2200 km of old channels like many tourists. tarif dégressif en fonction de la durée, tarif en fonction du nombre de personnes, acompte/arrhes à la réservation, remise des clés par le propriétaire. Enfants moins de 4 ans ne paient pas, et de 4 à 13 ans vieux paye 50 %.